Ryedale Calling Ecuador was an evening event held at the museum as part of the current family learning project. A live Skype-Video weblink was established allowing families from Ryedale to communicate directly with families from Ecuador. This was an opportunity to learn about the differences and similarities between our cultures. We discovered we share many traditions such as Christmas Carols and a similar Father Christmas tradition. There were also many differences such as national dress, food, wildlife and schooling among others. For some highlights of the night click on the videos below. One of the participants, Declan, was kind enough to bring his guitar and played some Christmas songs to those in Ecuador. The video below is of an improvised version of 'silent night', a song the Ecuador families knew in Spanish. To end the night the families in Ryedale and the families in Ecuador joined together to sing a few verses of 'We Wish you a Merry Christmas' led by Declan on the guitar. Some photographs were sent from Ecuador to educate Ryedale families about life in South America. 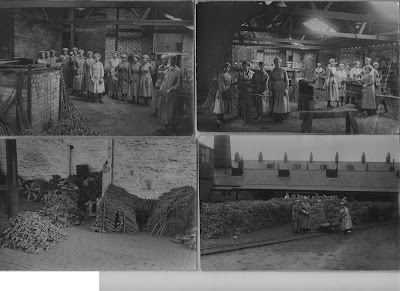 Some photographs of local life in Ryedale and from the museums collection, were sent to Ecuador in exchange. See the Ecuador photographs below, including some drawings that children in Ecuador drew for us. Christmas Weekend a Huge Success! Last weekend was the museum's free christmas weekend event. There were raffles, tombolas, medieval re-enactors, cakes, biscuits, book stalls, crafts, cooking, mulled wine, live music and more! The weekend was a huge success and we had over 1000 people through the doors over the 2 days. Some photographs of the event can be seen below. A big thank you to everyone who helped during the weekend, including staff and volunteers! Purpose of BLOG TRAINING is to give volunteers guidance on creating blogs that will explain to people using the internet the variety of work that the volunteers are carrying out at the Museum. On Thursday, 26 November, in Fat Betty's (warm seating area) John, Peter, and Albert enjoyed a day's tuition on blogging from Carrie and Jonathan. The training was one-to-one and enabled the trainees to create and post RFM blogs. The trainees found blogging interesting and they hope to update and add to their blogs so that the progress of the on-going work at the Museum can be recorded, monitored and given wider publicity. Watch this blog! Our Marshall Threshing machine, similar to the one seen in the Tess of the D’Urbervilles film, had rotted wheels. It has been limping along for demonstration days on modified Land Rover wheels but Traditional wooded wheels were needed. Armed with texts from the museum library, Albert and Peter set about building replacements using traditional materials and techniques. The Wheelwright shop at the museum provided original tools which we supplemented with a modern lathe, band-saw and planer. Traditional Timbers were selected , Oak spokes, Ash felloes. The original hubs, cast iron (Artillery hubs) were retained . Crucial to the success, was drawing the wheel, full size on a plywood base. We built the wheel on to this, checking angles and sizes as we worked. When the wooden wheel was completed Steve measured it’s circumference calculated the size for the steel tyre to allow for contraction after heating to fit. He cut and welded the original tyre to fit each wheel. The tyres are heated to bright red to cause expansion, quickly dropped over the wheel, then cooled to cause it to shrink and grip the whole structure together. Illustrations of stages in making the wheel. Hooping Plate used when fitting the rim. The Museum has a c. 1870s Marshall thresher dating from the second half of the 19th century. The thresher is used once a year Its wooden wheels are absolutely rotten and can not be renovated. We are attempting to make new wheels to the old pattern. We have recovered the tyres and metal stocks from the old wheels and these will be used built into the new wheels. The spokes are oak (x12 per wheel - for strength and load bearing) and the felloes (pronounced 'fellies') are made of ash (the six outer sections of the wheel - ash for springiness and resilience). If the stock (centre hub) was to be in wood, this would be made from elm because of its curly grain to give strength and resistance to splitting. We have cast metal or 'military' stocks or naves. The finished wheels will be hooped with metal tyres or 'hoops' that will be fitted 'hot' and allowed to shrink or 'nip' on to the felloes. The wheel will then be painted. Come along to the Museum's Christmas weekend celebration! Loads of festive fun and activities. Craft, Cooking, Raffles, Tombola (everyone loves a tombola!!) and lots more. There's even a medieval Christmas re-enactment. Most important of all it is FREE ENTRY! During October half term, local artist Sally came into the museum to work with visitors to create their own pieces of art. These fantastic works were then on display in the Manor House until this week. Have a look at the photos below to see the fantastic creations. Armistice Day and Remembrance Sunday will soon be here again, when we all remember those who gave their lives so that others could live. Looking through the collection Barry found a few photographs which most people will not have seen before. They are of Bamletts of Thirsk, which made agricultural implements and machinery. These pictures show the metal posts used for erecting barbed wire fencing in trench warfare. The workers, of course, are all ladies, the men who usually worked there being in the forces. On Thursday 12th November the museum is organising a play with local schoolchildren a the village hall in Hutton-le-Hole called 'Standing in Line' based on the Great War. Are you a family living locally? Would you like to take part in the Museums' family story project? Create your own piece of family history by making a digital photo story about yourselves. Mums, Dads, Kids, Teens, Grandparents, Aunts and Uncles, all are welcome to join in. The more the merrier! Realising the great stories there are, within ordinary family life. If you are interested please contact/ask for Carrie at the museum. I spent two happy afternoons last week carving pumpkins in readiness for the museum's halloween party. Needless to say, I only had time to quickly carve one for my own gate post at home! Having safely delivered all eight pumpkin lanterns on Friday I was left to ponder what to dress up as for the big night itself. I decided on lots of black and an old blanket for a shawl with severe black make up. With a basket of apples, my old crone outfit was complete. On arrival at the museum on Saturday evening Mike instructed me to frighten the children by jumping out at them in the dark as they were escorted up the site to the story teller. I hid behind a coffin, I am not sure how scared the children were, but it was great fun and my cackling gave me a sore throat. During the evening, I managed to take some very atmospheric photographs, I hope that they convey the sense of fun and hard work that went in to making what was a very enjoyable evening for all of the visitors, staff and volunteers alike. This week we have had plenty of activities including rug making and painting. Traditionally, this half-term week was one where children could earn some extra pocket money picking potatoes. At the museum we have been cooking potatoes, potato printing and using spud guns. On Sunday 31st October we will be having the Halloween Party with games, stories and plenty more. Ring us for more details, 01751 417367 and come and join in the fun. David Ruch will be coming to the museum this Sunday (25th October) -1300-1500, he engages the audience with his music and storytelling. I have now successfully been able to do my voluntary work without having distractions, ie. parties.In the past I have been asked to do some voluntary work but haven't been able to, so now I have decided that it would be better if I did help! I helped Andy open a Gallery exhibition on Friday evening and it was great fun !! I didn't do much but, Andy said I was a great help which made me proud. An Evening of Dance, Music, Storytelling and Fun! Nearly New - a 103 Falling Birds Production came to the museum this weekend. Audience Members were treated to a performance featuring live musicians, and all kinds of story-telling and prize giving antics. The event was held in the Manor House on site in the museum, a wonderful setting for such an imaginitive, surreal and lively performance. Audience member Sue described the event as "like having an old fashioned childrens story book come to life." Help open up museum (as usual) – you know what that insists of. · Hoover up and clean front desk and the shop. · Stock up the shop and do the float for the till. · Open doors to the public (2 minuets to 10 o’clock). Also I am now known as ‘the guy that can light a simple fire as the rest of the crew cant’ guy!! We have lots of fires in the buildings all around the museum and we light them if we are going to have special visitors round and teach children, just to give you a feeling of how it would have been if you were in those ages and conditions… Plus it also keeps us warm!! When we have loads of kids up we have to split them up into groups, and this also helps the Education team as they could not be able to teach round 60 children at one time, also they can teach the children different activities rather than the education team learning only one and just focusing on that one in particular. Opening the Museum is very quick if you get to know your way around, firstly I have mentioned the fact that I open Fat Betty’s on numerous occasions, and I have had to make that my new priority of the museum. What a way to go!! I have had to sort out the store room and price loads of gifts for the shop. This sometimes can get extremely senseless as it takes allot of time. Just as opening something you have to close it so another priority that I have is also the fact that I have to close Fat Betty’s and this includes; cleaning the drinks machine, turning off the lights ( cupboards and roof), also I do, do the sweeping, and also I clean out the bin. Then at the end of the day I help lock up the museum. Coffins. The badge used by the Lyke Wake Walk Club (and the New Lyke Wake Walk Club) is one of a coffin. here at Ryedale Folk Museum, we have a funeral bier and a horse-drawn hearse. John Nicoll, museum volunteer was involved in the restoration of the bier, read about it here at: http://ryedalefolkmuseum.blogspot.com/2009/07/kirkbymoorside-funeral-bier-restored-by.html. This post has attracted viewers from all over the globe, and has been linked to a forum called Coffin Talk. This is a message board for funeral directors, mortuary science students,and those with a morbid curiosity. Anyway, I just wanted to say thanks to John Nicoll for creating a very interesting post that many others have also found interesting. 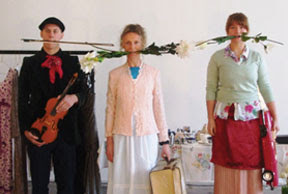 Nearly New is an excellent production that will be staged at Ryedale Folk Museum on Friday October 17th at 7.30 pm. This will take the audience through enchanting memories, long lost stories and entertaining moments. Adults £4, concessions £2. Have a look at the 103 Falling Birds website http://www.samlawrencedance.co.uk/103fallingbirds.html (photograph accessed at this source). 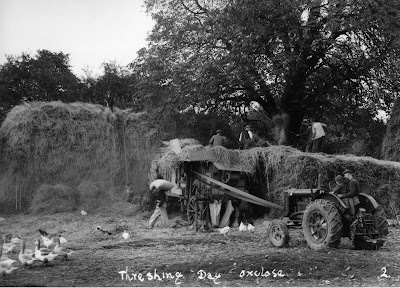 On Sunday October 4th we are having a threshing day at Ryedale Folk Museum. The thresher is a Marshall and was restored by staff and volunteers, come along and have a look. This is just part of a good collection of tractors and implements the museum has from days gone by. - Open doors too the public. - Do the float for the till. - Hover and sweep the floor. - Open till and stock up shop. For the passed few days I have been on the till sorting out customers, and stocking the shop with the help of a colleague, (Barbara). And at the end of each day I learn the importance of locking up and closing the museum making sure we haven’t locked anyone inside. Whalebones were often a feature of the farm gateway in the Ryedale area. During the eighteenth and nineteenth centuries, many farmers sons would go to sea with the whaling ships from the local ports such as whitby. The whalebones erected on the farm gateway were like a badge of honour, to show you had relatives at sea whaling. Please have a look at a previous blog post about a local man Wiliam Stockell, amongst his many adventures he spent time whaling. Being the Ryedale Folk Museum’s new Apprentice is ACE. I’ve learned in my three days so far to deal with the customers that enter and leave the grounds. Working on the till dealing with money as well as the admissions for the public. I have also learnt about the gallery and the different sections of art we do. I have been shown how to open the ‘ Fat Betty’s Café ’ and I have been able to study with the help of the crew and customers, some education of the museum before I even knew of its existence. I have even been given the pleasure to stock up the shop and use the labelling gun to do some pricing of the gifts that we sell and I had been given the opportunity ( which I choose to do so ) to organise the store room which took up allot of A, effort and B, time. I am helping with the ordering and the orders of gifts in the shop and the office. With the help of the team I’m sure I can cope. Where could you go in a museum and see activities from completely different eras within yards of each other? Ryedale Folk Museum, of course. We had an excellent group of iron age re-enactors who were demonstrating different crafts from the period. These included wood-turning, pottery, weaving and textiles. Today, volunteers and staff were treated to a lovely dinner of stew, cottage pie, beetroot, and jacket spuds. Us blokes were even lucky enough to get a pint of Black Sheep. For afters - if you had room, was a smashing apple crumble and cream. Thanks very much to everyone who prepared that lovely meal. After dinner we got busy harvesting the cornfield. We got off to a slow start due to the weather, it was very overcast and drizzly before dinner, but we got the field done with the binder and stooked the sheaves. The binder probably dates from the 1940's, a Sunshine Massey Harris from Australia, and the tractor used to pull it is a MF 135 from the 1970's. I'm off to British Columbia to a place called Bella Bella to stay with Harvey Humchitt and his wife. I'm also going to visit New York, Boston and Chicago! It is around 14:00 hrs Canadian Pacific time. I’ve just got of the plane in a place called Bella Bella home of the Heiltsuk in British Columbia after travelling for 40 hours. On the plane was a woman and her teenage son, her bag had on a great first nation design with the words Heiltsuk honouring our women. I gather from her conversation she is going to a funeral. The airport is tiny and it’s really really raining. I’m met by Harvey Humchitt who is one of four chiefs of the Heiltsuk and his wife Brenda. 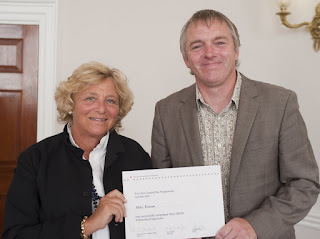 I had met Harvey at a conference in Austria aiming to increase the sharing world wide of cultural objects. Harvey has a good-sized boat and Brenda is the principal of the school. There are around 1400 people live in Bella, around 1300 are first nation. Brenda has nipped out of school to pick me up there is to be a sponsored run that every school in Canada takes part in raising money for cancer but she’s going to postpone it, the weather is that bad. I’m told I’m going straight onto Harvey’s boat, a prominent member of the community has died, Harvey is taking the family across to an Island out at sea called Grave Island. First stop bread, beef and salad in case anyone wants to eat, I’m struck by the folk shopping, all have a mix of Canadian flag and or Heiltsuk design on their clothing. The girl stacking the shelves has a fleece on with the words Heiltsuk proud of who we are. This place is no tourist trap. Harvey knocks me up a proper doorstop sandwich and a coffee you could chew on. The gravediggers go on ahead in a 3-man boat as we set off. I meet the family that want to travel. We have 7 people on board and the boat is full. The weather is really bad; Harvey has real trouble just getting the boat from the pier as the wind keeps pushing him back. We set off with the remains of Deanna Muriel Lawson. Deanna who was not of first nation heritage had come to Bella Bella as a young nurse and had a massive impact on that community. She married Chester Lawson a high school teacher. Her Eulogy written by Pauline Waterfall talks of her roots. This is a constant in Bella Bella everyone talks about their roots. ‘’Deanna’s roots included Danish roots through her mother and English ties to Devon through her father. She was proud of this heritage, while embracing and accepting the Heiltsuk roots into which she was adopted and married. She was always respectful and accepting of her husbands culture and ways, knowing that this added to the richness of their children’s multicultural inheritance.’ Harvey explained later how Deanna had been adopted by a family that means wolf as a mark of respect. Being adopted was real and they became a normal member of that family. There is a big political storm in the region; I’d read about it in the paper on the plane. In a more remote reservation where around 1000 first nation folk live further up the coast there was only limited medical support for 3 days. The regional authority in response to the swine flu epidemic had sent a planeload of body bags rather than further medical support. This has of course sparked real anger and drives the conversation a while as we head towards Grave Island. Harvey points out the eagle’s nests in the trees on the Island as we approach. Deanna is to be buried along side grand parents from her adopted family, another great mark of respect. A young family member had been taken off timetable to make the cross that would mark the grave in the schools design and technology department. I ask Harvey about the politics. Its much better now, we do have a voice and in law we must be consulted. He then tells me though that the huge logging firm had wanted to flatten part of the forest that was of great cultural value to The Heiltsuk. They were consulted with and it ended up with the government commissionaire crying in Harvey’s house saying there was nothing he could do the loggers had been formally given permission to log. The loggers never came however and it had remained a mystery until Harvey was invited to a big environmentalist conference. It would seem Harvey who had continued as expected to fight the loggers wrote to the buyers of the wood in Europe. He set out the cultural importance of the forest to his community in his letter and it was the buyers who stopped the logging! Harvey’s tactics celebrated at the conference. That evening it is Deanna’s settlement feast. The sports hall is booked and full of folk. Everyone cooks and contributes money. The money is then dished out by Deanes family to pay for all kinds of expenses from grave diggers to family that have travelled but most goes to the community through donations to school and to the cancer charities. There is a huge banner with designs representing eagles and whales with the red ribbon representing the fight against cancer. Chester, Deanna’s husband talks about their life and invites various family members to come and talk about their memories. I’m sat on the table with the chiefs and feel privileged to be at the feast. Chester then invites me to speak and explain why I’m here a real unexpected honour. One of the chiefs finishes off the evening talking about how proud he is of his people and how politics are now redundant and it is through community that people are most powerful. That this sense of community and the ways of expressing this sense of community are what has been handed down from their ancestors. He talks a lot about values and connects them to their shared sense of who they are. Harvey invites him to come fishing with us tomorrow; I’m hoping he can come. Finally, there is an announcement that there is a cougar in the village, this is unheard of they normally stay in the forest; there is plenty to eat and no reason for them to come into the village. At another settlement children have been attacked with one killed. With a warning to keep children safe the feast is ended and we all pour out of the sports hall and go home. I’ve been in Bella Bella for 7 hours now and I now know why I’ve come. Come and see the binder in action on Sunday at Ryedale Folk Museum. We will be pulling the P.T.O driven binder with one of the museum's collection of tractors. After the wheat is harvested the corn will be stooked and left to dry, then put in the shed until October when it will be threshed. The video below is from a similar binder in Carnew, Ireland. Labels: binder, Carnew, harvest day, Hutton-le-Hole, Ireland, loader tractor, Ryedale Folk Museum, stooking, threshing day. Most people will have heard in the media that it is 70 years since Germany invaded Poland. Everyone has a relative who took part in the war, and Ryedale Folk Museum is no exception. 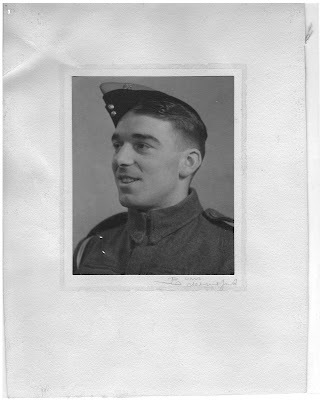 Bert Frank, the museum founder had a brother called Christopher (Kit) who perished in 1943 aged 25. This is a video of a half size Morris Minor Pickup powered by a 125cc Kawasaki engine. Morris Minors, very nostalgic cars, will be at the museum in force on Sunday 6th September. Come and have a look at these lovely vehicles. If you fancy cooking some traditional food after a visit to Ryedale Folk Museum, then the book Ryedale Recipes by Peter Brears is ideal. There was plenty of food around today, Kevin Sims made a ham mushroom and pea pie with jacket spuds in the White Cottage, whilst Peter was busy in Stang End with chicken, bread cheese and vegetables. In the Tudor Crofter's cottage Emma Hirst was cooking small mint pancakes, a joint of bacon and vegetable stew. As yesterday, all was made to a very good standard. Today, staff and volunteers were cooking at the museum using traditional methods.Trout, rabbit, pigeon, turnip stew were all being prepared by these enthusiasts. Last Friday I took a few pictures of some of the museum's livestock. The Lincolnshire Curly Coated pigs and Gloucester Old Spots have grown since the last blog entry http://ryedalefolkmuseum.blogspot.com/2009/04/new-pigs-at-ryedale-folk-museum.html. The Light Sussex and Marsh Daisy hens are laying and looking well. On 24th August the Muscovy duck hatched 10 eggs and we now have 10 lovely ducklings. The Alliance Française is an international organisation with branches in many countries all over the world. Its aim is to promote the French Language and Culture. The York branch, affiliated to the ‘Federation Britannique des Alliances Française’ (AF UK) was established in 1994 and is a registered charity. · Our regular monthly meetings take the form of illustrated talks in French on topics of general, cultural and current interest, or the showing of French Films. · Social events, or soirees, are also organised to promote social gathering of Francophones and Francophiles alike. 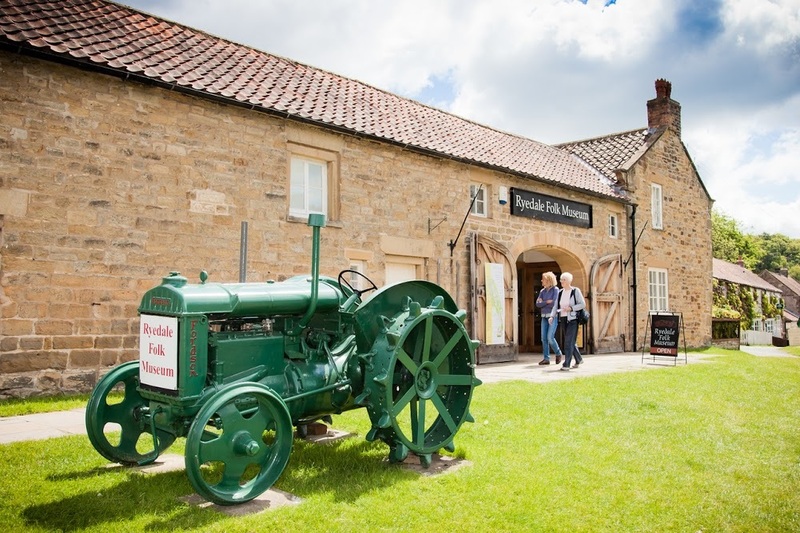 · Special events, like the ‘Bastille Day’ at Ryedale Folk Museum, are the perfect opportunity to meet new people, to experience aspects of French culture in a fun way. · All our classes are led by native French speakers. Courses are offered at all levels, from beginners to advanced and run during the day or in the evenings. · We also offer 1-2-1 tuitions that are tailor-made to suit the specific requirements / needs of our learners whether preparing for a job interview, a French exam at school, or a move to a French speaking country. · Business French and intensive courses can be arranged on request. From October 09, we hope to run 2 new projects: a ‘French Drama Group’ and a ‘French Choir’. We are also looking into ‘French for mums and toddlers’. So if you would like to know more, get involved, or become a member, do not hesitate to contact us. We would love to hear from you, http://www.afdy.org.uk/ , email;afdy@allfrance.fsnet.co.uk tel: 01904 65 68 27 . Here is some footage of the prize giving from Tractor Day 2009. Earlier this year, I came to the museum and we were wondering what we could do to raise funds for the Harrison Collection. I came up with the bright idea of completing the Lyke Wake Walk. This made sense, after all Ryedale Folk Museum had had the collection of artefacts donated by the Lyke Wake Club, and there is even a building named ‘Fat Betty’ after one of the stones en-route. Andy and Mike also appeared at first to be enthusiastic, but after some thought, they both declined to take part. Maybe they were wise to do that? The initial plan was for me to do the walk in June, Andy was co-ordinating volunteers and staff to meet me at various check points along the way. Unfortunately this attempt was unsuccessful. I had really bad blisters on both my heels, I got sunstroke and the compass decided to spin round in circles after the Lion Inn. So I sacked it and was returned to the museum by Judith in her 4x4. Everyone thought I was mad when I said I was going to do the entire walk again. Some said; ‘Just do the second half mate, it’ll be enough’. No, the Lyke Wake Walk has to be done in one go, from Osmotherley to Ravenscar in its entirety. On August 8th, in just over 17 hours I did it.When I stopped for a bit of dinner at the Lion Inn, Blakey ,http://www.lionblakey.co.uk/ I got a shock to see an R.A.F search and rescue helicopter parked outside. Upon entering the barman did not know what made a ploughmans lunch so if you read it mate,here are the ingredients:Bread,cheese, pickle, apple/beetroot, and maybe some tomato and salad. It is not unknown for some kind of meat to accompany this delicious dish; http://www.icons.org.uk/nom/nominations/ploughmans-lunch . It is traditionally washed down with a pint of good ale. I was fortunate to meet Mike and Tim from Kent, who accompanied me after the Lion Inn, I’m always nervous on that section as I find it easy to go wrong, but it was ok this time. There was much bog to cross, I was up to my waist in mud several times, but I finished it. It was dark by 2200 hours, I’ve never been as glad to see my fiancé Suzy and my son Tom when I got to the end. Now I’ve got to collect the sponsor money… Hmm wonder if I should do it again next year? 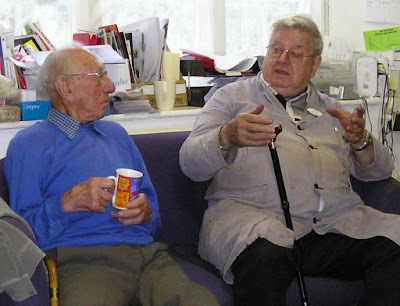 Two of the museum's lively volunteers, 98 year old Geoffrey Willey, (photographer) and the slightly younger Robin Butler, (blacksmith) take a well deserved break after an eight hour shift at the museum. On the 18th July thousands of steel workers on Teesside marched, with banners and a brass band, to try to save their last blast furnace from closing. For over a hundred years much of the ironstone that went into the furnaces came from the Cleveland ironstone mines, including Rosedale. 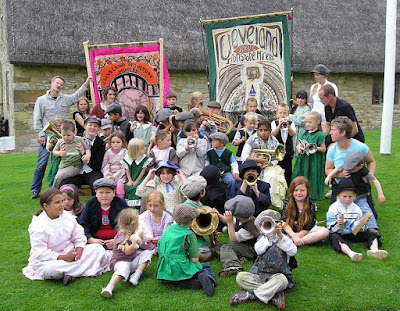 On the 24th July, 40 young people from North Ormesby, near Middlesbrough, came to the museum and using banners and brass band instruments, recreated the Cleveland ironstone miners first ever Demonstration day. The original gala, held in 1872 in Skelton, included men from the Rosedale mines. Some more footage of Tractor Day 2009. Can anyone spot a former Prime-Minister? Last weekend we were very fortunate to have a group of Polish people from York at the museum. These short films show some of their cooking expertise in the White Victorian Cottage, using nothing more than an open range from the nineteenth century. Some of their fayre included stew and dumplings and a most delicious cabbage soup. Today was tractor Day at Ryedale Folk Museum. Exhibitors from far and wide brought in their prized tractors, stationary engines, implements and vehicles for visitors to see. The museum's Fordson Dexta and Massey Ferguson 135 loader tractor were amongst the exhibits which were all in excellent condition. If it was not for these enthusiasts, the future of these machines would be in doubt. In the years before the advent of the National Grid, it was essential to have a power source on the farm. Initially stationary steam engines were used, and then with oil powered engines, these petrol and paraffin engines were used for a variety of tasks such as generating electricity, pumping water, powering milking machines and milling grain. At 2p.m, the tractors drove through the museum grounds and did a loop round Hutton-le-Hole. I was very fortunate to have a pillion ride on the 1950's B.S.A B31, owned by museum volunteer Jim Wood. There's nothing like the sound of a British motorcycle. In June I got a phone call from Mike “can we do Stig of the dump.” Stig of the dump, I learned, is a children’s book and film, often taught in schools. Stig is a stone age man marooned in our time and found living in a den in an old quarry by a group of children, “of course we can do Stig of the dump.” Whitecliffe Primary School arrived at the museum two weeks later and we made Stig’s den behind the roundhouse. Andy would have made a perfect Stig but refused to wear the rabbit skin loincloth, but he did help the children make some charcoal, and they used it to make stone age drawings in the roundhouse. After lunch they daubed the den with mud and made and tested bows and arrows. Finally after showing Stig his new home the children recreated the flint and watch scene from the book. Exhausted after a busy day some of the children fell asleep on the bus home. Well done Whitecliffe School. We are all from Lady Lumley's sixth form in Pickering; Megan is here for two days, Katy for one week, and Robyn for two weeks. This is our first day of work experience at Ryedale Folk Museum. None of us really knew what to expect but we were pleasantly surprised by the welcoming staff and casual nature of the museum. We spent our first day shadowing Bex and Emma as they led actvities for a group of Amotherby school children. It was very interesting and enjoyable as we saw the hands-on approach to teaching, and we assisted the children in experiencing Victorian-style washing and Tudor house building. We also had to explore the museum and familiarise ourselves with the exhibits, and the animals. Overall it has been an enjoyable day! Today we had a visit from another school group, and we were able to help them take part in several new activities, including Viking Pottery and Crofter's Cottage (although this had to be relocated due to a torrential downpour!). Megan helped out at the front of house and assisted a coach party, and Robyn and Katy prepared for the Victorian Chores session which they will be leading for a school group on Thursday. Despite the rain, it was another fun day. Megan is no longer with us :( But we have had a fact-filled and interesting day. This morning we were set the task of creating activities for the upcoming Festival of British Archaeology, which is taking place from Saturday 18th July to Sunday 2nd August. This was a challenge as neither of us know very much about archaeology, however we are learning new things all the time. This afternoon we observed two new sessions: Tudor Handwriting, and Tudor Medicine (including creating plague remedies) - the school group really enjoyed these activities. At the end of the day we had another rehearsal for the Victorian Chores session which we will be leading tomorrow, hopefully in costume! Today we dressed up and led our first session: the Victorian chores in the White Cottage. We had a group of Year 1 children from Hemlington Hall school, who were split into four groups. We had to take one group at a time and talk to them about the cottage, show them the different rooms, and help them to beat rugs, scrub steps, and make toast over the fire. This was great fun for us and for the kids, and although we were a little pushed for time, there were no major incidents! After cleaning up all of the materials from the sessions we fed the pigs the leftover bread, and then continued our planning for Tractor and Engine Day. Today we had a more relaxed day, as there was only a small school group and we did not have to help them. We have done several jobs: we helped to finish the preparations for Tractor and Engine Day, which is happening this Sunday, by creating activities for children (i.e. building mini tractors!). We also continued making our trail around the museum for the Festival of British Archaeology, which involved a lot of printing, guillotining (Robyn's favourite) and laminating. Finally, we were taking care of the animals at the museum: we visited the sheep, and fed the pigs and chickens; and Katy said farewell to the museum. I'm all on my own now but its been really quite fun because there's been loads of people in helping with STEM people in and thankfully there was a lovely fire man in. Today there were about 150 children in from the surrounding area. I also over saw a meeting between Mike and some students and took notes on the enterprise day that will be taking place on Wednessday. Again the people from the STEM fair were here again so the first thing I had to do was help them set up and get the children to there first activity. I then spent the rest of the day leasing Norton and Ryedale schools for the enterprise day and getting some things organised, like where each activity is going to take place and then back ups if the weather turns bad. however most of these jobs had to be done once that children had left and weren't possible to do before then. so when the kids left I helped Andy set up the marquee, this took a lot longer then I thought it would, unfortunately I wasn't able to get my other jobs done. We have had the enterprise day to day which is where year 10's form 2 schools take over the museum, they are given £250 and they are set the challenge of making a profit. To start the day I instantly had a problem, because the costumes needed by Norton school had been lent out and not brought back so I had to improvise. I then helped them to set up and had to do a slight re-arangement of rooms when an area was no longer suitable for the story telling. When they were set up I had a wander round and sampled a few of the products that they were selling - all of which were very nice indeed. These included fruit smoothies, baking, scarecrows and portraits which I took with someone who was organising the activity. I also helped another Robin in the blacksmith's and got to have a go myself. This I found fascinating because it is something that I would like to learn for my design work at school. At the end I helped with the tidying away. KIRKBYMOORSIDE FUNERAL BIER . RESTORED BY JOHN NICOLL. 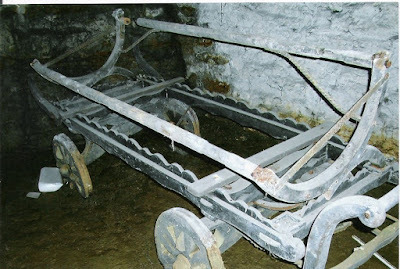 Constucted by local craftsmen entirely of pitch pine , the bier consists of two parts , the wheeled carriage on which the coffin was transported and a railed frame on to which the coffin was transferred and borne into Church and afterwards to the graveside. The frame has three rounded hand grips on each side for bearers to hold. After the burial the two items would be reunited and returned to the cellar until it was next required. 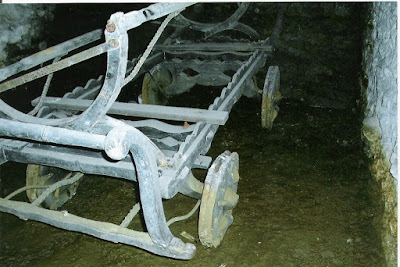 Recently a visitor offered another possible explanation of it's operation.His suggestion was that the coffin would not have been carried directly on the wheeled cart as the cobbled streets would provide a very bumpy ride , the coffin would have been suspended on leather straps fastened around what we assumed to be carrying handles on the upper frame.We would appreciate any other ideas . Looking rather like a sleigh , the bier is articulated for steering and has pushing bars at each end. The wheels were made from two pieces of 1" pine laminated together to prevent twisting, interesting to note the pieces were not edge jointed but were cut from a single plank and are 13" diameter , quite a tree ! Sadly the wheels had to be completely replaced as they were badly rotted . Removing the wheels revealed 4" diameter solid brass machined bearings and 1" diameter steel spindles, these originals were badly worn showing regular use over many years and were rebuilt into the new wheels. Tyres for silent running over the cobbled streets were made from 1.5" diameter hemp rope. Original fibres were found in the wood at the bottom of the tyre grooves. The frame had also to be replaced as all the timber had suffered the same fate as the wheels . I was interested to see that the carrying rails were beautifully made 6' 6" long and very accurately decorated by making the rails 10 sided . This is consistent with high quality decoration throughout the bier's constuction. The whole unit was finished by an ebonising process and had generally lasted well where the timber remained sound. Many photographs were taken during the bier's restoration and are now in the museum archives and the completed item now sits in our undertaker's premisses. We were pleased to receive sponsorship for the project from Funeral Directors .W.Bumby . of Kikbymoorside. RESTORED FUNERAL BIER , PRIOR TO FRAME BEING FINISH PAINTED BLACK. JOHN NICOLL . WORKSHOP VOLUNTEER . RYEDALE FOLK MUSEUM. Join us for fantastic singing and banjo performances from these great American musicians. Jerry regularly sings 'old songs old style' on both sides of the Atlantic whilst for Ralph this will be his first visit to England after retiring from well-digging. Ralph is an exceptional exponent of the old-time style of banjo and a great ballad singer. 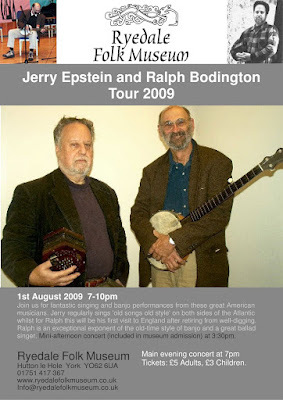 For more information and to hear some sample tracks please visit the following websites... www.minstrelrecords.com/bodington.htm and www.minstrelrecords.com/epstein.htm. Mini-afternoon concert (included in museum admission) to be held at 3:30pm. Tickets: £5 Adults, £3 Children. would be doing activities and other projects over my work experience fortnight. schools that were coming in for an Iron Age themed day. I did Daubing on the Iron Age round house, with three groups of primary school children from Middlesbrough I then helped to prepare a learning session for tomorrow with another group of school children. The third day of my work experience.There are some more schools in the museum today and they all dressed up in Victorian dress, and did Victorian based activities like making butter, wash clothes and Victorian chores. When the schools had gone home and some of the visitors had left Bex had her history club in, Lewis ran it for her on ancient sport which he had researched earlier on in the week. Today was the warmest day yet and I have a feeling its going to get hotter folks. At the end of this first week of my work experience I have gained in confidence and new knowledge. I have thoroughly enjoyed my first week and I am going to enjoy my second week as I might be changing the displays in the dry seating area and working in archives. It's the start of another week at Ryedale folk museum and today was a bit more interesting than walking around and assisting with the schools. I was cataloging and archiving today at mid day a fellow member of staff and I put a display together ready for Thursday when we go to Malton hospital to put it up. The second day of the second week - I was researching activities for the 'Festival of British Archaeology' so I wrote a quiz and put together a word search. Again I did some odd jobs around the museum. On Wednesday the girls who are on a work placement and I made up a trail for the the FBA- (Festival of British Archaeology) and produced a certificate for the Kirkbymoorside Beavers. We also made a prototype tractor for the weekend. Thursday - Helen and I prepared some objects for the TIC (Tourist Information Centre) and some objects for the enterprise day next Wednesday to go in some feel boxes for the children. After dinner Helen and I went to Malton Hospital to change the displays today - was great. Friday, the last day of work experience today. I helped the costume dept identify all but one of the scout badges on the Boy Scout uniform. I cleared all the nettles from the chicken coop and did bits and bobs on the gardens around the museum ready for the judging. I have really enjoyed being here at the museum and hope to come back in the summer. I have learned so many different skills from Victorian washing techniques to communication skills. I feel that I have grown in confidence and have gained friends during the process. 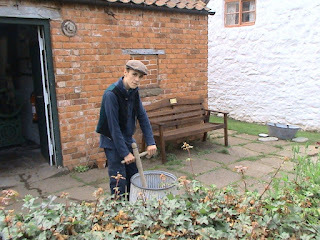 From the 16th of June until the 3rd July Lewis Delaney did his work experience at Ryedale Folk Museum. Along the way he has learnt a lot about the museum and history side of things. He also had an insight into the communication side of a business by taking part in meetings and talking to new faces. This is particularly important at Ryedale Folk Museum as there are many volunteers, each different every day. His confidence in tasks and answering questions has increased and he always offered support to staff and visitors alike. This is Lewis giving a brief account about his two weeks experience here at the museum. On my first day I nervously approached the entrance to find it was shut. I was terrified I had got the wrong time and was going to make a terrible impression on my first day. However two volunteers who were working that day saw me, and asked if I was doing my work experience. They showed me the way into the building, they were very willing and kind. I was shown around the museum, as I hadn't been before. This was very beneficial as I learnt a lot in the first half hour about the museum, things like where to go, and who works where and also about the history of the buildings and how they have been preserved. Later on at 10.30 the school arrived and I was all set to learn a bit more about the museum and what happened during a normal day. I joined up with a group and firstly did cruck construction, the children had to make a Tudor style A-frame known as a cruck. Next we went into one of my favourite parts of the museum, which was the Crofters Cottage .This is definitely worth a visit, it really sends you back in time and makes you realise just how hard things would be for the average Tudor in England. I followed the school around for the rest of the day and learnt about Tudor handwriting and also medicine. The key thing I learned from the day was meeting new staff and spending time with each one which really helped me settle in. After the school went I did some small but important jobs for people and I thoroughly enjoyed my first day. On the second day I was more confident as I now knew a few people. I went to the Manor House to meet Wendy who I was helping for the day. We got set up and ready for the school who were again doing a Tudor day. In the morning Wendy and I were doing the cruck with the children, they thoroughly enjoyed it. I did too, I helped the children where they got stuck on the construction. All the teachers were very appreciative of my help which made me feel very valuable and important. I stayed with Wendy for the rest of the day and helped tidy up after the school had gone. I learnt today that there are many jobs that are time consuming but go unnoticed by people. Little things like putting wheat out and pricing things for sale in the shop. I really settled in well in the first two days, everyone made me feel so welcome. I was meant to have a meeting with Mike and people from York University but it was cancelled. This was unfortunate, as I was really looking forward to talking to them, and understanding more about the business side of things at the museum. My third day was spent on a project which was chosen for me as I had expressed my interest in sports. Today, John, of the volunteer team was busy restoring the miniature keep, part of the collection of miniature buildings donated by Harlow Carr Gardens,Harrogate. This weekend the museum is hosting events based around the popular story of Wind In The Willows, the play being performed live performed outdoors (depending on the weather) by the Library Theatre. 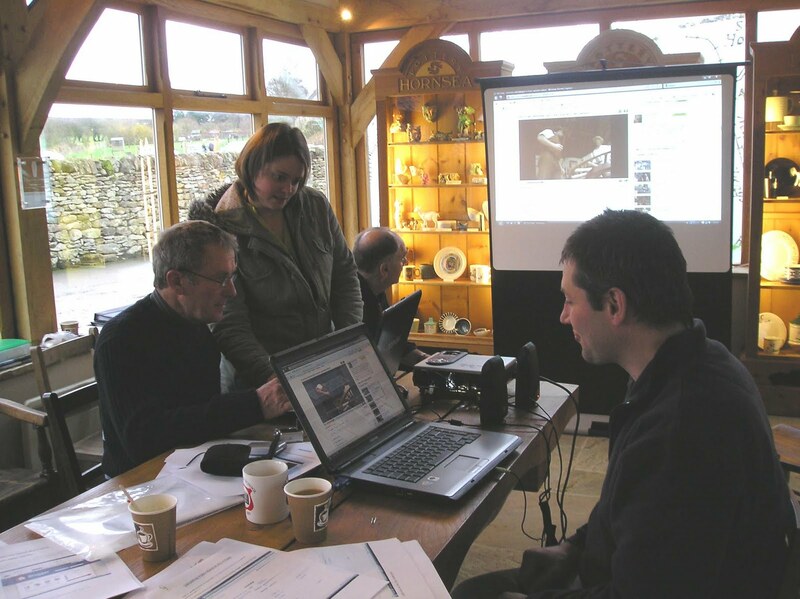 Museum Director Mike Benson giving his thoughts on the volunteer led blog training days. 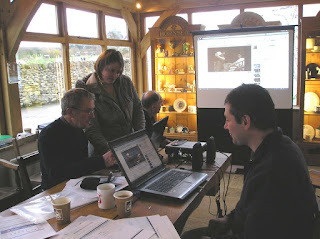 This week the museum held two days of blog training for some of the volunteers. It is a nice way for volunteers to introduce themselves and many now have the power to show the world what it is they do at the museum. This was a great few days and so far has been a success, many of the trainees' first posts can already be seen on the blog. Above are some photographs of the day with the blogging trainees hard at work. The training was for the most part a volunteer activity, with volunteers training other volunteers. 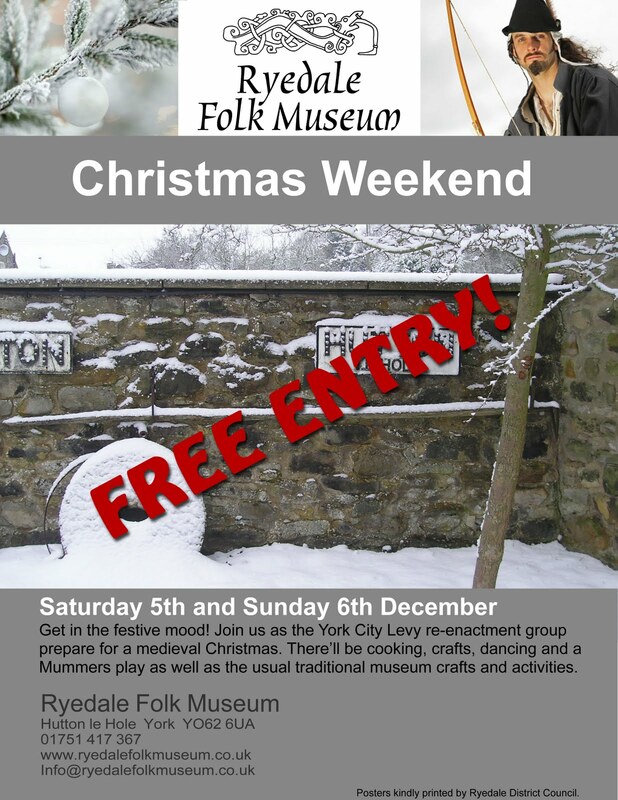 The hope now is that there will be many more people contributing to this blog on behalf of Ryedale Folk Museum. Random pictures on a blustery day. Our names are Will, Sam and Ally and we have made this blog to show you things we did and tell you about the variety of skills we have learnt from this experience. For example on our first week we ran the NAAFI ( A cafe for the armed forces in the WW2) which gave us great pleasure and enjoyment serving a whole variety of different people, these ranged from Australia, America, Lancashire and London. Throughout our second week we have been doing a variety of tasks, for example on Monday we cut out the materials for the rag rugs and found recipes for our day of cooking on Tuesday. On Tuesday we cooked three recipes in Stang End, oat biscuits, drop scones and leek and potato soup. On Wednesday we partly restored an old plough which was hard work. During Thursday we all separately went round with a school and helped out with their various questions and activities. Finally on Friday we learnt how to make this blog and publish our experience about the museum and what an excellent placement choice it is. A blackbird has built its nest on a tup's skull , which was attached to the roof beams by members of the Museum Club. Cleo (my dog) and I have been volunteers here for about 10 years. I normally do chair seating, basketry and weaving, including Iron Age weaving. Susan is one of three volunteers responsible for the library. Much of the library was donated by the founders Wilfrid Crosland, Bert Frank and Raymond Hayes. Volunteers usually carry out these important "Front of House" activities. 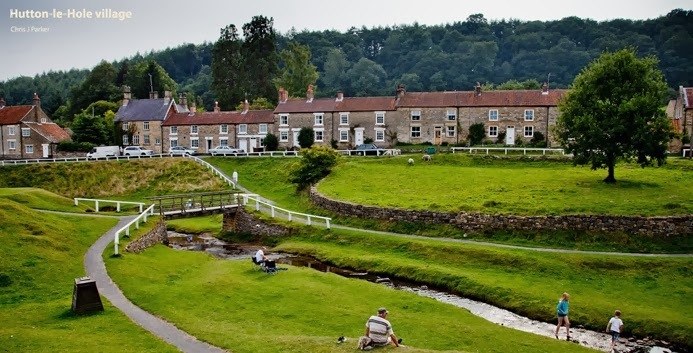 They encourage visitors to make Gift Aid donations; answer enquiries about walks in the area for the N Yorkshire National Parks Authorityand encourage sales from the well stocked shop. I am John Lawson, a storyteller at the museum. I have been coming to the museum for five years, telling stories about the people of Ryedale. These stories include ironstone miners, WW2 shop keepers, cruck house builders, iron age ploughmen etc. My name is Fred Mynot, and I came to the Museum about four years ago after retiring, in order to do painting and odds and ends of repairs. After a year I arrived at the office one morning to a circle of grinning faces and the comment " Oh, Fred, you used to be an architect didn t you?" I gave a very hesitant "yes". "We're having trouble with a Planning Application, can you help?" The rest is history! After getting Planning and Building Regulation Approvals for Fat Betty's, I was persuaded to do the working drawings, specifications, tender and contract documentation. What a surprise! This led on to various other drawings for alterations, extensions and bits and pieces, some done, some being done and some in the pipeline. It's great working for a client without the bother of sending in a bill!! And thank goodness for computer aided drawing. I also continue to do painting and other odd jobs, and some signwriting, quite badly! Working at my computer is not what I really volunteered for as I value the companionship to be found in the workshop, the pub next door, and such like. So I hope to keep going on the odds and ends for Kevin. Another Condition Survey and Report on the buildings is overdue! After all that self-centred rubbish there is one person I would like to mention. In order to take on the tasks I was given, it was necessary for me to re-activate some of my other life in Kent. My chief assistant of many years, Trevor Leith, went to the firm who took over my business, and I had to get from him our old CAD programme for my computer. He now also prints all my drawings, with the kind agreement of the new office, and it is he who looks at them and advises me of any matters on which I am out-of-date! Its like being a student again!! Thanks to Trevor, and hopefully some of both staff and other volunteers may meet him when he comes to see some of the results! My name is Jude Bloomfield and I have only started as a volunteer at Ryedale Folk Museum earlier this year. So far I have 'lived' in White Cottage as a villager, demonstrating making drop scones etc. I have also helped out with Victorian washdays when children can experience how washing used to be done.